As Israeli intelligence services raise alarms about the prospect of radical Jewish groups attacking the mosques atop the Temple Mount, an eerily similar controversy is simultaneously developing in India, with possible lessons and implications for Israel. According to legend, the god-king, Lord Ram, one of Hinduism's principal deities, was born in Ayodhya, about 540 km southeast of New Delhi. The Moslem conquerors of India destroyed the temple commemorating his birthplace centuries ago and built a mosque, known as the Babri Masjid, on the ruins. This was by no means a unique replacement. 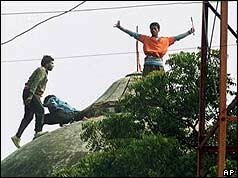 Hindu nationalists tore dwon the Babri mosque in 1992 with just small explosives and bare hands. Ayodhya's temple was the most prominent of 1,600 destroyed Hindu sites, and that made the Babri Masjid especially unacceptable to the fundamentalist Hindus in the Bharatiya Janata Party (BJP), which made Ayodhya the central plank of its 1991 election platform. These efforts culminated on December 6, 1992, when BJP officials led a march to the Babri Masjid and an out-of-control crowd climbed the centuries-old mosque, furiously demolishing it by hand and with explosives. This led to India's worst outbreak of communal rioting since the 1947 partition of India and Pakistan, with 2,000 to 3,000 people losing their lives and violence spreading to several foreign countries (including Britain). Despite its high drama, this episode resolved nothing. Where a temple and a mosque once stood now lies an empty plot of land (and many policemen). Some Hindus insist on rebuilding the temple to Ram; some Moslems demand the Babri Masjid be rebuilt. A court case disputing the land's ownership has been wending its way through the torpid Indian legal system since 1949, with no end in sight. Since coming to power in 1998, Prime Minister Atal Bihari Vajpayee and the BJP have downplayed their goals in Ayodhya. As recently as October 2000, the BJP's president assured Indians that rebuilding the temple was not on his party's agenda. But the issue has resurfaced anyway and it may come to an explosive head shortly. Near the disputed site in Ayodhya, a Hindu nationalist group, the Vishwa Hindu Parishad (VHP), is building a pre-fabricated temple that it plans soon to assemble on the site as a three-story building. The first floor, it declared in July, is "almost ready." Ignoring Vajpayee, the VHP plans soon to begin on-site construction of the temple, perhaps as early as March. Moslem groups have threatened to stop this, with force if necessary. Ayodhya prompts several thoughts relating to the Temple Mount. These situations are not conducive to compromise; in general, one side wins, the other loses. Achieving otherwise in Jerusalem would be a remarkable feat. Religious hotheads can trump governments (al-Aksa's fire in 1969, Ayodhya's destruction in 1992), showing the deeply unpredictable nature of holy sites and the high priority for governments to control them. The timetables are strikingly similar: Jewish schemes to avenge the murder of Binyamin Kahane by destroying Islamic holy sites in Jerusalem parallel VHP plans for a Hindu temple. Although the Babri Masjid is a far lesser Islamic holy place than Jerusalem's Haram al-Sharif, should plans to rebuild the Hindu temple go ahead, this could deflect the Islamic attention that for months has been heavily focused on Jerusalem. May 7, 2010 update: A zoning board in lower Manhattan has approved the application by the Cordoba Initiative to build a $100 million Cordoba House two blocks from Ground Zero, the site of the former World Trade Center. This smacks of the same triumphalism noted in the first bullet point above. Related Topics: Islam, Jerusalem, South Asia | Daniel Pipes receive the latest by email: subscribe to the free mef mailing list This text may be reposted or forwarded so long as it is presented as an integral whole with complete and accurate information provided about its author, date, place of publication, and original URL.